Satya Nadella is in Mumbai for the Future Decoded event today; during his keynote, the Microsoft CEO announced a new app for Skype, that isn’t quite new. In December, last year, the Skype team released a new Skype app for Android. Skype Mingo was built from scratch and came with some unique features, for instance, it could not only work as a Skype client but also a phone dialer and an SMS messaging app. It’s essentially an all-in-one, like Apple’s iMessage. 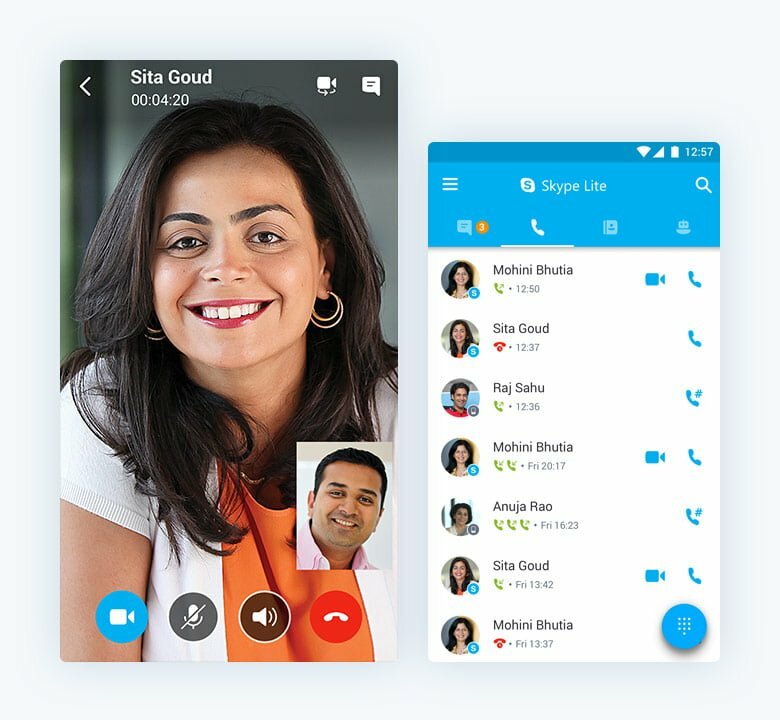 Today, Satya Nadella launched Skype Lite for Android. Skype Lite is the final version of Skype Mingo. Skype Lite is designed for use specifically in India. The app consumes an extremely low amount of data and assumes that the data connection will come in bursts and be dodgy at best of times. It doesn’t require high bandwidth and can work on the slowest of 2G networks. It’s also a mere 13 MB in size, making sure that users on older underpowered Android devices can use the app without worrying about their storage space. And yet, the app supports some of the most advanced Skype features like the new Bot Framework and its conversational UI. 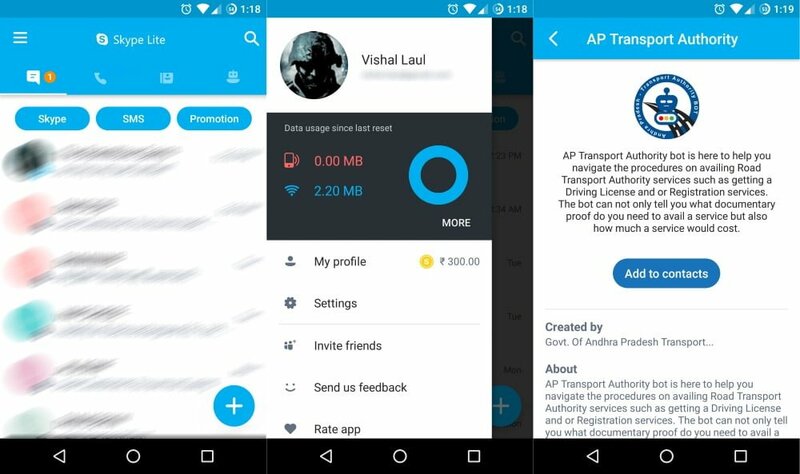 The government of Andhra Pradesh, an Indian state, is already using the Bot Framework to deliver vehicle registration services over Skype. Skype Lite will compress photos before uploading them, saving data for its users. If the user forwards a photo, it’s done within the Skype cloud, saving the user’s data and time. India is a multi-lingual country with thousands of different languages. Skype Lite, for now, supports seven of them. Bengali, Gujarati, Hindi, Marathi, Tamil, Telugu, and Urdu. It also supports English. Though all that is great, Skype Lite have had to make some compromises as well. Skype’s emoji are downgraded just to a still image rather than their animated selves. Skype’s video emoji, on the other hand, have been removed entirely. These compromise, among a few others, are obvious ones. It’s how Skype Lite is… light. Text messages are a big thing in India; just last month, a Microsoft Garage project attempted to fix India’s SMS spam problem. The Indian government uses SMS to inform its citizens of their rights, and provide updates for certain services; banks use SMS to alert customers about transactions and raise awareness about secure banking; businesses use them to promote their products. The last one, of course, is a problem: the spam generated by SMS messages can become quite a lot quite quickly. Skype Lite, therefore, can sort SMS messages by the use of its machine learning voodoo magic. The app features two sections: SMS and Promotional. The ‘Promotional’ section only shows messages that the app thinks are promotional. It’s reminiscent of how the Microsoft Garage project works, making us wonder if the team contributed to Skype Lite as well. 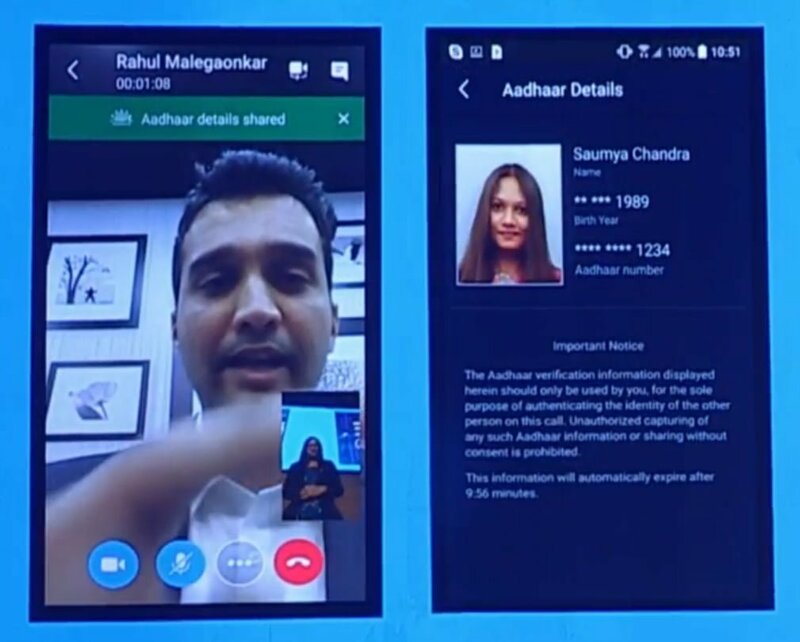 At an event in September, last year, Microsoft India’s Chairman Bhaskar Pramanik said that Microsoft was looking into integrating Skype with India’s Aadhaar biometric authentication system. If you are not aware of what Aadhaar is, here’s a summary; it’s a biometric authentication system for Indian residents. It’s part of the ‘India Stack,’ a group of APIs that the Indian government has been building over the past decade. Aadhaar is perhaps the most important API in India Stack; the system can authenticate the identity of anyone registered within the system via their fingerprint or iris scan. The Indian government primarily uses Aadhaar to deliver subsidies to its citizens as well as provide various services. At the event in September, Pramanik envisioned some interesting use cases for Aadhaar integration within Skype. Today, the Indian government has given its go-ahead to Microsoft, with all the required permissions. The Skype team plans on integrating Aadhaar into the app by June 2017. It seems the initial use case will be somewhat modest: verifying the identity of unknown callers. Several organizations have been critical of the Aadhaar system for its lax rules around privacy; the proposed Skype integration, therefore, could be troublesome, if not done right. The Skype Lite is available right now via the Google Play Store. It’s still in Beta, but it’s better than Skype Mingo’s Alpha. The Aadhaar integration is obviously not a part of the app just yet, but it will be interesting to see how Microsoft handles this sensitive information.